Pascale Osterwalder is an animation artist and does visual design and illustration. Ivan Averintsev, Wolfie Christl and Ralf Traunsteiner have been working together for more than 10 years. They were deeply involved in the famous Viennese net culture organization Public Netbase from 2000 to 2006. When they´re not working on Data Dealer, they´re creating sound, performance and other art stuff - using many different pseudonyms. Or they´re working on state-of-the-art web apps for commercial clients. Data Dealer is developed by a small team based in Vienna, Austria - also including collaborators from Germany, Switzerland and the US. We´ve been into gaming, open source and hacktivism since the late 90s. 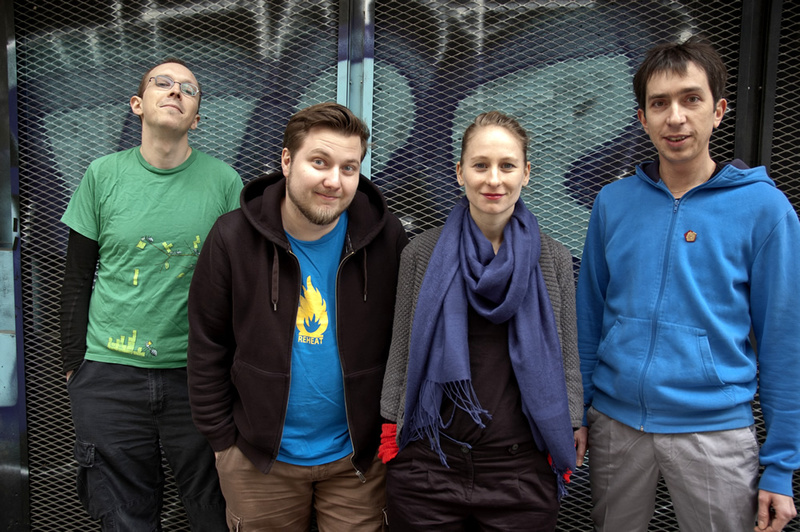 In our past we´ve been open source advocates, web developers, theorists, historians, artists, activists, mathematicians, educators, punk rockers, noise musicians, designers and illustrators. We love digital technologies, but the investigation of the social impacts of information technology is critical for a society in which people are enabled to make a positive and self-determined use of it. Wolfie Christl: Idea, Script, Producer. Pascale Osterwalder: Illustration, Character Design. Ralf Traunsteiner: Director, Cutter, Animation, Sound. Nils Olger: Cutter. Renée Winter: Editor. Barbara Schweinzer: Translation. Molly Roza: Translation. Heather Kelley: Text & Cultural Consulting. Konrad Becker, Gabriele Bramauer, Thomas Brenner, Clemens Christl, Severin Christl, Johannes Grenzfurthner, Bernhard Jungwirth, Andreas Liberda, Erich Möchel, Sebastian Moritz, Rupert Nagler, Ferdinand Pay, Lollo Pichler, Andrea Salzmann, Felix Stalder, Maria Traunsteiner, Markus Tumeltshammer, Barbara Wais, Markus Zachbauer, Hannes Zeger, Atelier Pater-Schwartz-Gasse, Bürogemeinschaft Karl-Schweighofer-Gasse and many more! Aaron Swartz, Acxiom, Bruce Schneier, Choicepoint, Cory Doctorow, Facebook, Games for Change, Google, Lexis Nexis Risk Solutions, Public Netbase, RapLeaf, Slime, Zynga. Thanks to Yvonne Schüttler (Voltaire) and Vernon Adams (Bowlby One SC) for the fonts we´re using. Thanks for samples & audio tracks in our video trailer to: music-for-video.com (Free Library), Voktebef ("Noisettes"), Zapac feat. greg_baumont („They're coming...“, FreqMan (freesound.org) und supergrott (soundcloud.com/supergrott). jQuery, RaphaëlJS, underscore.js, Python, Django, Pyramid, Twisted, MongoDB, PostgreSQL, Node.js, nginx, uWSGI, Memcached, RabbitMQ, Debian GNU/Linux, LXC, fabric. Git, LibreOffice, vim, yEd, Zope/Zwiki, Firefox, Chromium. Many thanks to our backers on Kickstarter! !